Availability: Out of stock. Estimated to ship in 3-4 weeks..
Based on the swords of Norse warriors on seafaring adventures and pillaging raids, the Viking II LARP Short Sword with Black Handle is an impressively safe and durable weapon for LARP combat, made of latex-free Calimacil foam. This ultra-sturdy, wear-resistant foam surrounds a flexible fiberglass core. 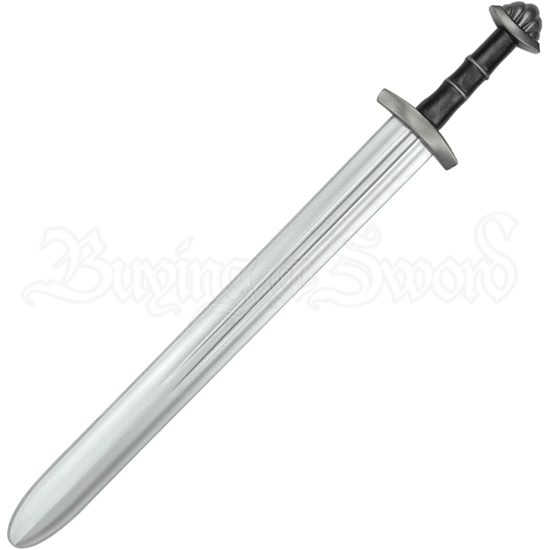 The wide blade has a double fuller and a steel coloration, with a slightly darker steel color on the short, blade-wards turned guard and lobed pommel. The grip has a black leather look with two steel colored braids around its center. Whether your LARP character is a brave Norseman, Valkyrie, or a warrior from the realms of fantasy, this Norse inspired LARP weapon has a versatile length and style that will be right at home in many historical and fantasy LARP settings.